Are You Constantly in Conflict with Your Child? Does everyday feel like an uphill battle with your child? Is he or she acting out, talking back, yelling or showing aggression toward you or others? Is he or she withdrawing or acting sneaky? Have the conflicts between you and your child affected other family relationships or spilled over into school? Are you struggling to figure out the source of your child’s negative behavior? Do you wonder if it’s something you did or if your child is being exposed to something unhealthy while outside of your care? Are you feeling anxious, isolated or defeated? Do you think that everyone would feel and function better if you could just figure out how to communicate more effectively with your child? Engaging with a defiant child can be an extremely frustrating and stressful experience. It’s common to feel burnt out, powerless and confused. It can be challenging to just get through normal routines and meet the needs of family members, as well as your own. You may be spending more and more of your time either walking on eggshells or perpetually putting out fires. You may also have ongoing anxiety about what each day will bring and what things will look like in the future if you can’t work through seemingly small issues now. Experiencing conflict with one or more of your children is more common than you may think. A lot of parents have a difficult time sharing their experiences or asking for help because they may feel embarrassed or become socially isolated due to their child’s behavior. And, without the right support or tools it’s possible for these parent-child conflicts to spiral and turn into behavioral patterns that are harder and harder to break. The good news is that therapy has proven to be very effective in helping families resolve conflict issues. If caught and addressed early, conflicts don’t need to turn into long-term problematic patterns. Your child’s outward, negative behaviors may be your child expressing to you that something is wrong – which can be a very good thing. Rather than being viewed as a challenge, conflict can be looked at as an opportunity to figure out what’s going on under the surface and develop new and healthier ways to communicate. Your BPS therapist can provide your child with a safe place to express and share their feelings. Their role is to help your child understand these feelings and learn more appropriate ways to express them. While working with your child, your therapist will also stay in close and regular contact with you. You’ll get feedback, strategies and “homework” that you and your child can practice together. The goals are for everyone to improve communication skills, to develop a common language and to find a communication structure that works for your whole family. With help, you can learn tools to better navigate communication breakdowns, foster your parent/child bond and effectively resolve conflicts. This is your child’s and your life and wellbeing. Addressing the conflicts that are arising between you and your child now may prevent a host of problems from occurring as he or she enters new developmental stages, such as adolescence. Working with a therapist on communication and conflict issues now may not only address the problems, but also keep unhealthy patterns from being established. Many people come to BPS having worked with other therapists who were not trained to work specifically with parent/child conflict issues or who they or their child couldn’t relate with – which is a waste of time and money. At BPS, we’ll conduct a referral assessment and match you with a therapist who is trained and experienced in working with children and conflict and whose personality is a good match for you and your child. Once you find that good match, making a commitment to your child, yourself and your family may be one of the most valuable investments there is. Imagine everyone in your home feeling and functioning better on a regular basis and ask yourself what that’s worth. Although we have issues, it seems like my child is too young for therapy. Couldn’t this just be a stage that my child will grow out of? If you and your child are experiencing significant conflict and it’s been going on for some time, chances are that it’s simply not going to just go away. Actually, there’s a good chance that the conflicts could get worse – especially as your child enters into new developmental stages, such as adolescence when there is a natural tendency to rebel. Heading off unhealthy patterns now before they become too engrained can help prevent greater difficulties from occurring in the future. Therapy can also provide you with some immediate relief. Do you really want to wait until your child is a teenager and you’re truly at your wit’s end before you seek help? With help, everyone can begin feeling and communicating better now. I feel like we’ve tried everything – including therapy – and nothing has helped. Assuming that the previous therapist was a good match, therapy not working in the past could possibly indicate the extent of the problems that your child is having and the conflict within your home. If that’s the case, it’s important that you consult with another therapist or childhood expert. Early intervention can be extremely effective and yield long-term, positive results. Finding the right therapist is critical, too. BPS is committed to helping you find the best match for you and your child. Your BPS therapist will work with you to understand what you’ve tried and what hasn’t worked in the past so you can develop a new approach. Together you’ll explore what can be done differently and the unique needs of your child and family. And, just because therapy didn’t work in the past, it doesn’t mean that your child won’t make some important breakthroughs with another, more effective therapist. Children change and grow everyday and you never know when something might just click for them – or for you. Although you are understandably frustrated, it’s important that you don’t give up. With the right help, you and your child can begin feeling better and start communicating in much healthier and more loving ways. You can also check out our free, online therapist directory, which will match you and your child with a therapist who has expertise working with parent/child conflict issues. BPS therapist Jennifer Key, LCSW helped create the content for this page. Jenny has been working with parents and children struggling with conflict since 1999. She practices traditional therapy methods, such as psychoanalysis and cognitive behavioral techniques, but has also found that many children experience significant, positive change while interacting with animals. 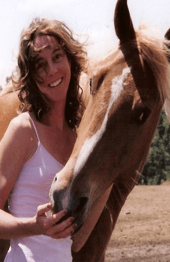 Jenny’s practice includes equine and animal therapies.